Truly one of the Greatest anime ever!!! 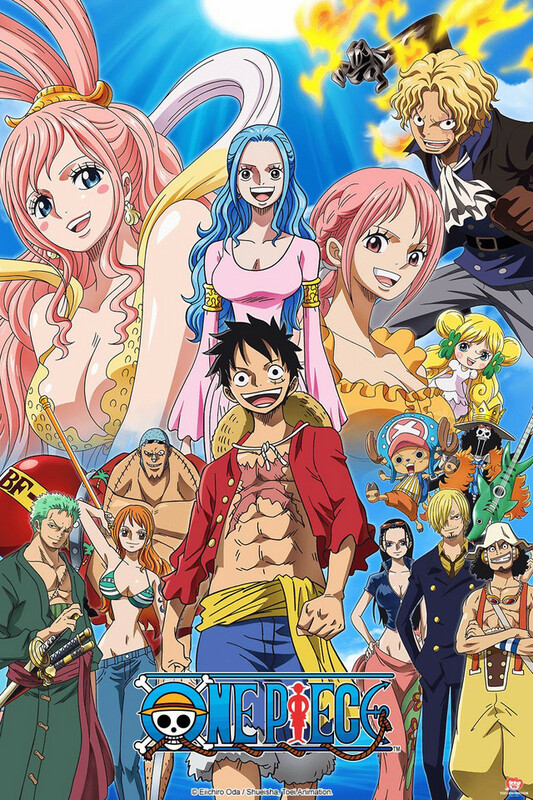 One Piece features monkey D. Luffy who dreams of becoming pirate king and finding the treasure One Piece. He finds crew members along his adventure. This show contains just about every genre to anime there is: Adventure, Action, Comedy, etc. This show has an amazing cast of characters who truly make this show stand out. The main characters (the Strawhat crew) are really interesting and as you watch this show you will see and truly appreciate the strong bond they build with one another as well as their character development. Its pacing changes throughout the show but its what make this show incredible. This show truly excels in just about every aspect it presents. I understand that some people will put this show off because of its length, but that makes it even more interesting, as marathoning it will make it really enjoyable. I truly recommend this show to everyone. No matter how many times you watch it, each episode is rich of excitement and at one point you will be re watching episodes from the past, and they still end up good as they were when you got to them! Best Show To Watch Ever! One Piece is my all-time favourite anime series. If you like adventure shows with a little comedy mixed in, you'll love this series. From an excellent group of characters to an excellent storyline, this show has something for everyone! I'm so excited to be able to watch it off Crunchyroll! This is simply the greatest tv show of all time. Out of any country, out of all tv shows, cartoons, and anime, this is number one on Earth. I may have only started a few years ago, but from the very beginning, I got the feeling that something huge lay in store for Monkey D. Luffy. There are numerous adventures (and even a few mis-adventures, I'd say) throughout the entire series. I was hooked from the start, and I still cant get enough! It is extremely funny. In fact, ever since I started this anime, a few older ones I used to watch and laugh at, are not really funny anymore. I used to be hooked on Naruto, and laughed hysterically at the little jokes made here and there. When I began One Piece, I laughed much harder, and when I went back to watch Naruto again, I just couldnt laugh. It wasn't as funny as One Piece! Some may beg to differ, but One Piece practically embodies my sense of humor. My all-time favorite fictional character, Roronoa Zoro, comes from this series, but each and every character is unique, including the ones not important to the story line. There are around 700 or so and all of them have their own story, whether it is revealed directly from the show, or not. Not even the background characters look the same, most of the time. If you pay attention close enough, you might even catch a glimpse of this anime's version of Waldo, named Pandaman, who also has his own back story. The plot is marvelous and it thickens as time goes by. Not all the arcs are equally fantastic, but I believe they all have their own value. Some people, though, may need to watch at least 50 episodes before they decide to continue, as the beginning can seem rather slow or uninteresting for some. Overall, this is a wonderful anime that exceeds all others by far and should be enjoyed by people of all ages. Just remember to stay away from the 4-Kids version!! Please enjoy this series as I have, it is truly a wonder to behold. ONE PIECE is what made me go from liking anime to loving anime. It has the best characters and not only is the action great but is so hilarious. No one beats Luffy he is by far one of the best characters ever.